In a broadly interdisciplinary inquiry such as this, communication itself can pose quite a challenge. Typically, the greatest difficulties in communication will occur when one is questioning something already “known” to be true. On matters of underlying principle, the confidence behind established ideas can be so high that discussion itself may seem quite senseless. This difficulty is aggravated by fragmentation of the process by which information is gathered and evaluated. The specialization of intellectual inquiry carries with it certain risks when assumptions within one discipline rest upon prior assumptions in other disciplines. No one can be an expert on everything, and when considering possibilities outside one’s personal expertise, it is only natural to defer to what specialists in other studies claim to know. Given the extreme fragmentation of established science today it is difficult to imagine that the enterprise as a whole could ever “correlate all its contents.” Yet extraordinary strides toward that “someday” envisioned by Lovecraft may now be possible through a new approach – one in which electrical phenomena receive the full attention they deserve, and all appropriate fields of evidence are included. To some, the prospects may appear every bit as disturbing as Lovecraft imagined. But for those who instinctively seek out unifying principles, the new horizons will be at once breathtaking and hopeful. The Electric Universe is a holistic answer to myopia * – that narrowing of vision which naturally accompanies the fragmentation of knowledge and learning. * Myopia – a disinclination to acknowledge the existence of something. For those with the courage to see clearly, the required “unlearning” of fashionable ideas carries no real cost whatsoever. The terror Lovecraft envisioned is only the first rush of uncertainty, when ideas long taken for granted are thrown into question by facts and simple reasoning previously ignored. The “piecing together of dissociated knowledge” will only require us to confront the deep contradictions in things experts have long claimed to know. With the courage to see clearly, the adventure itself could well be “the most merciful thing in the world,” adding new insights into the greatest dramas of early human history and vital perspective to humanity’s situation in the cosmos. Lovecraft did not realize that the “terrifying vistas” are but a mirage seen through an open door. The truth is always unified, and as such it can only be friendly to those who seek the truth first. As we pass through the door, it is not fear that goes with us, but the exhilaration of discovery. The Electric Universe model is a coherent “Big Picture” of our situation in the universe, spanning many disciplines. It highlights repeated electrical patterns at all scales that enable laboratory experiments to explain the strange, energetic events seen, for example, in deep space, on the Sun, and on Jupiter’s moon, Io. The Electric Universe works backward in time using observations rather than forward from some idealized theoretical beginning. It provides simple answers to problems that are now clothed in fashionable metaphysics and mysticism. It is more interdisciplinary and inclusive of information than any prior cosmology. It points to practical possibilities far beyond the limits set by current science. The Electric Universe model grew out of a broad interdisciplinary approach to science. It is not a technique taught in universities. The Electric Universe is based more on observations and experiment than abstract theory. It recognizes connections between diverse disciplines. It concludes that the crucial requirement for understanding the universe is to take fully into account the basic electrical nature of atoms and their interactions. Strangely, this is not the case in conventional cosmology where weaker magnetism and the infinitely weaker force of gravity rule the cosmos. Such a simplification may suit a theoretical physics based on electrical neutrality of matter in Earthly laboratories but it does not apply in space where plasma dominates. Plasma has been called the “fourth state” of matter, after solids, liquids and gases. 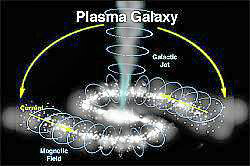 Most of the matter in the universe is in the form of plasma. A plasma is formed if some of the negatively charged electrons are separated from their host atoms in a gas, leaving the atoms with a positive charge. The negatively charged electrons, and the positively charged atoms (known as positive ions) are then free to move separately under the influence of an applied voltage or magnetic field. Their net movement constitutes an electrical current. 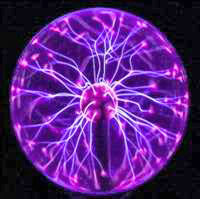 So, one of the more important properties of a plasma is that it can conduct electrical current. It does so by forming current filaments that follow magnetic field lines. Filamentary patterns are ubiquitous in the cosmos. The pieces of the Electric Universe “Big Picture” are supplied by some remarkable individuals, most of them unknown and who have lived or are living “quiet, unobtrusive lives” away from universities. For those with a sense of history this fact should serve to increase curiosity rather than dull it. Most revolutions in science have come from people who taught themselves outside the academic system and were not constrained by the fallacies and fashions of the day. It has been well documented that modern institutions of science operate in such a way as to enforce conformity and prevent research and publication of revolutionary ideas. J. R. Saul argues that medieval scholasticism was re-established during the 20th century. If so, the new “Enlightenment” will have to come, as before, from outside academia. For me, enlightenment began with the controversial polymath and author of Worlds in Collision, Immanuel Velikovsky. In 1950 he demonstrated an interdisciplinary, comparative technique for uncovering hard evidence of planetary catastrophe from the recorded memories of the earliest civilizations. His method was forensic in that he looked for reports of physical events of a highly unusual nature that were nonetheless corroborated globally by totally separate cultures. Then by applying scientific knowledge of cause and effect, it was possible to build a very detailed model of the sequence of those events. Finally, the model enabled specific predictions to be made and confirmed – a requirement of a good scientific theory. Some of the predictions he made were outrageous at the time: Venus would be near incandescently hot, Jupiter would emit radio noise, the Moonrocks would be magnetized, and so on. Velikovsky was right, astronomers of the day were wrong. However, you will not find any textbook that gives him credit because his theory was judged to be wrong. Presumably they were all lucky guesses! This allowed a dogmatic response by academia to Velikovsky’s seminal breakthrough. It was said his theory didn’t obey Newton’s laws. But what did Newton know of electricity? And if anyone believes that Newton’s laws guarantee a stable planetary system – think again! Any gravitational system with more than two orbiting bodies is unstable. Yet the question is hardly ever asked, let alone answered, “what produces the observed stability of the solar system” Velikovsky was convinced that the clue lay in his discovery that electrical forces dominate the incredibly weak force of gravity at times of planetary close encounters. Although he was unable to explain at the time how this would create the observed stability of the solar system, with his uncanny prescience he had pointed the way to the Electric Universe. Since then skeptical scholars have shown Velikovsky’s historical perspective of cataclysmic events to be wrong. However, his basic premise of planetary encounters has been confirmed and the details fleshed out to an extraordinary degree. Several pioneering researchers in this new field now agree that awe-inspiring planetary encounters did occur in pre-history. 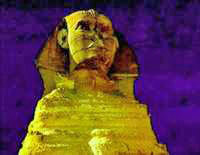 To the most ancient civilizations they were a culturally defining memory. They were the inspiration for pyramids, megaliths, statues, totems and sacred rock art. The survivors of global upheaval felt it imperative that the memory be preserved and passed down faithfully to future generations in the expectation that the “gods” would return. The memorialization took the form of architecture, ritual and story to re-enact the apocalyptic power of the planetary gods over human destiny. Such a catastrophic beginning explains why civilization appeared like a thunderclap out of nowhere. Unfortunately, with no reference points in the present behavior of the planets, the stories lost their real meaning. This short explanation may seem contrived until the wealth of supporting evidence can be presented. However, it highlights the crucial distinction between the planetary catastrophism of the Electric Universe and that of neo-catastrophists who attempt to explain the evidence for planetary encounters in terms of cometary phenomena. Modern comets simply do not fit the descriptions from the past. Nor can they account for abundant evidence of fresh looking planetary cratering and scarring. Besides, in an Electric Universe comets are not the apocalyptic threat to the Earth imaginatively portrayed by artists. Such pictures are entirely fanciful because a comet would be disrupted electrically by a cosmic thunderbolt before it hit the Earth. The only visible evidence remaining would be an electric arc crater like Meteor Crater in Arizona. The Electric Universe model grew from the realization that a new plasma cosmology and an understanding of electrical phenomena in space could illuminate the new work being done in comparative mythology. In return the images of events witnessed in the prehistoric sky and their sequence could help unravel the recent history of the Earth, Mars and Venus. By accepting data over a far wider span of knowledge and human existence than conventional cosmology allows, the Electric Universe model began to provide pragmatic and common sense answers to many questions that seem unrelated. It followed the entreaty of the Nobel Prize winning plasma physicist and cosmologist, Hannes Alfvén to work backwards in time from observations rather than forward from some idealized theoretical beginning. H. Alfvén & G, Arrhenius, p. 257. The result is now a “Big Picture” that emphasizes our dramatic prehistory and essential connectedness to the universe. No longer do we have to look at ourselves and the universe through the distorting sideshow mirrors of modern science. The implications of electrical activity between planets will be profoundly disturbing for those who have built their cosmology around the weak force of gravity, acting in an electrically sterile universe. This strange, dogmatic oversight guarantees that nothing will remain in future of the fanciful Big Bang theory or the simplistic story of the formation of the solar system. The Big Bang is already dead! The unheralded “Galileo of the 20th century”, Halton Arp, has proven that the universe is not expanding. The Big Bang theory is based on a misinterpretation of redshift. The redshift of a distant galaxy is measured in the light coming from that galaxy. Lines in the spectrum of that galaxy show a shift toward the red compared with the same lines from our Sun. Arp discovered that high and low redshift objects are sometimes connected by a bridge or jet of matter. So redshift cannot be a measure of distance. Most of the redshift is intrinsic to the object. But there is more: Arp found that the intrinsic redshift of a quasar or galaxy took discrete values, which decreased with distance from a central active galaxy. In Arp’s new view of the cosmos, active galaxies “give birth” to high redshift quasars and companion galaxies. Redshift becomes a measure of the relative ages of nearby quasars and galaxies, not their distance. As a quasar or galaxy ages, the redshift decreases in discrete steps, or quanta. The huge puzzle for astrophysicists is why a galaxy should exhibit an atomic phenomenon. So we turn to particle physics. This difficulty highlights the fact that quantum “mechanics” applied to atoms is a theory without physical reality. The weirdness of quantum theory has been attributed to the subatomic scale to which it applies. But now that we have quantum effects in something the size of a galaxy, this convenient nonsense is exposed. If Arp is right many experts are going to look very silly. His discovery sounded the alarm in some halls of Academe and since nobody likes a loud noise – particularly if they are asleep – the knee-jerk response was to attack the guy with his finger on the alarm button. Arp’s telescope time was denied, papers rejected, and he was forced to leave the US to pursue his work. For more than 10 years plasma physicists have had an electrical model of galaxies. It works with real-world physics. The model is able to successfully account for the observed shapes and dynamics of galaxies without recourse to invisible dark matter and central black holes. 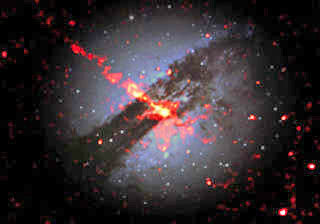 It explains simply the powerful electric jets seen issuing along the spin axis from the cores of active galaxies. Recent results from mapping the magnetic field of a spiral galaxy confirm the electric model. 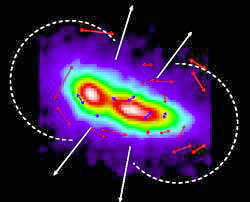 More recently, inter-galactic magnetic fields have been discovered which is the final straw to break the camel’s back. Incredible gravitational models involvinginvisible “black holes” have had to be invented in a desperate attempt to explain how the attractive force of gravity can result in matter being ejected in a narrow jet at relativistic speeds. Plasma physicists argue that stars are formed by an electromagnetic “pinch” effect on widely dispersed gas and dust. The “pinch” is created by the magnetic force between parallel current filaments that are part of the huge electric currents flowing inside a galaxy. It is far more effective than gravity in concentrating matter and, unlike gravity, it can remove excess angular momentum that tends to prevent collapse. Stars will form like beads on a wire until gravity takes over. The late Ralph Juergens, an engineer from Flagstaff, Arizona, in the 1970’s took the next mental leap to suggest that the electrical input doesn’t stop there and that stars are not thermonuclear engines! This is obvious when the Sun is looked at from an electrical discharge perspective. The galactic currents that create the stars persist to power them. Stars behave as electrodes in a galactic glow discharge. Bright stars like our Sun are great concentrated balls of lightning! The matter inside stars becomes positively charged as electrons drift toward the surface. The resulting internal electrostatic forces prevent stars from collapsing gravitationally and occasionally cause them to “give birth” by electrical fissioning to form companion stars and gas giant planets. Sudden brightening, or a nova outburst marks such an event. That elucidates why stars commonly have partners and why most of the giant planets so far detected closely orbit their parent star. Stellar evolution theory and the age of stars is an elaborate fiction. The appearance of a star is determined largely by its electrical environment and can change suddenly. Plasma physicists and electrical engineers are best able to recognize plasma discharge phenomena. Stellar physics is in the wrong hands. Earth-like planets and moons are similarly “born” by electrical expulsion of part of the positively charged cores of dwarf stars and gas giants. That explains the dichotomy between the dense rocky planets and moons and the gaseous giant planets. In the Electric Universe model, gravity itself is simply an electrostatic dipolar force. So planetary orbits are stabilized against gravitational chaos by exchange of electric charge through their plasma tails (Venus is still doing so strongly, judging by its “cometary” magnetotail, and it has the most circular orbit of any planet) and consequent modification of the gravity of each body. Planets will quickly assume orbits that ensure the least electrical interaction. Impacts between large bodies are avoided and capture rendered more probable by exchange of electric charge between them. Capture of our Moon becomes the only option, it cannot have been created from the Earth. Evidence of past planetary instabilities is written large on the surfaces of all solid bodies in the solar system. That evidence is in the form of electric arc cratering. Electric discharges between closely approaching bodies takes the form of “thunderbolts of the gods“, or distinctively shaped helical plasmoids. Such plasmoids were sculpted by many ancient cultures when depicting Jupiter hurling his thunderbolt. 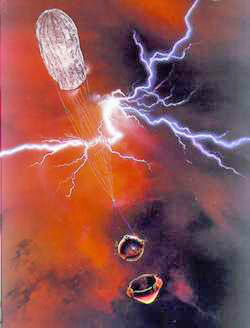 Jupiter’s thunderbolt raises questions about the history of mankind and the Earth that have never before been asked. When it comes to dating planetary surfaces, plasmoids cause characteristic electrical arc scarring in the form of sinuous channels and neatly circular craters with steep walls and occasional central peaks. Such craters are universally misinterpreted as impact craters. The sinuous channels are wrongly classified as riverbeds or lava channels. Minutes or hours of electrical scarring can produce a surface like that of the Moon, which is later interpreted in ad hoc fashion to be billions of years old. Hemispheric differences in cratering are expected in this model. And for the skeptics, subdued electric arc machining of a planet-sized body continues to this day on Jupiter’s innermost moon, Io. 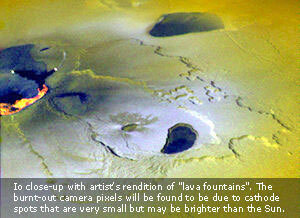 See the many successful predictions about the discoveries that would be made as close-up images of Io became available. Planetary geologists are not trained to recognize electric arc scarring otherwise they would have seen at a glance the characteristic cathodic surface erosion andcathode jets on Io. They are definitely not volcanoes as we know them from geology textbooks. Most people are unaware that we have no understanding of how lightning is created in clouds. The simplest answer is that lightning is not generated there at all. Clouds merely form a convenient path to Earth forelectricity originating in space. Without clouds it is possible to have a “bolt from the blue”. That is happening onVenus (although the sky certainly isn’t blue). Weather systems are driven primarily by external electrical influences. Consequently the Sun has weather patterns. And the most distant planet, Neptune, has the most violent winds in the solar system though it receives very little energy from the Sun. Electric discharges from space cause Mars‘ huge dust devils and planet-wide dust storms. They are responsible for Jupiter’s Great Red Spot and the “spokes” in Saturn’s rings. 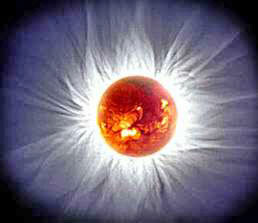 It is why Venus has lightning in its smog-like clouds and its mountain-tops glow with St. Elmo’s fire. 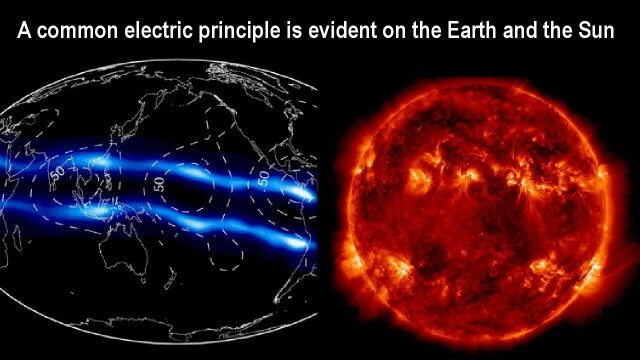 It is why the Earth has lightning stretching into space in the form of “red sprites” and “blue jets”, and why tethered satellites “blow a fuse“. The image on the right is NASA artist’s view of lightning on Venus during the descent of one of the Pioneer probes.Venus has smog-like clouds that are not expected to generate lightning and yet the planet suffers intense lightning. This argues against the popular notion of what causes lightning. It seems that when a dwarf star or gas giant planet “gives birth” to a rocky satellite, parent and child usually remain closely bound. Our solar system, with its widely spaced orbits and chaotic features, appears to be the result of a recent cosmic “traffic accident“. This seemingly wild conjecture is supported by the global stories of prehistoric planetary encounters. So to use our situation as a measure of a normal planetary system will give wildly misleading ideas of how life begins and estimates of the likelihood of life elsewhere in the universe. The most benign situation for life in an Electric Universe is inside the electrical cocoon of a brown dwarf star. Radiant energy is then evenly distributed over the entire surface of any planet orbiting within the chromosphere of such a star, regardless of axial rotation, tilt, or orbital eccentricity. The exceedingly thin atmosphere of such stars has the essential water and carbon compounds to mist down onto planetary surfaces. The reddish light is ideal forphotosynthesis. Such a model provides one reason why the Search for Extra-Terrestrial Intelligence (SETI) project is unlikely to succeed. Any advanced civilization on such a planet will be unaware that the universe exists outside its own stellar environment, and radio communication through the glow discharge of the star is impossible! “The machines that are first invented to perform any particular movement are always the most complex, and succeeding artists generally discover that with fewer wheels, with fewer principles of motion than had originally been employed, the same effects may be more easily produced. The Electric Universe takes a simplifying leap by unifying the nuclear forces, magnetism and gravity as manifestations of a near instantaneous electrostatic force. Instead of being “spooked” by the concept of action-at-a-distance, like most physicists this century, the Electric Universe accepts it as an observational fact. Anyone who has tried to force two like poles of magnets together has demonstrated action-at-a-distance. “Electromagnetic” radiation is then simply the result of an oscillating electrostatic force. At the level of the atom, the Electric Universe model takes a lead from the work of Ralph Sansbury, an independent New York researcher. Foremost is the simple recognition of the basic electrical nature of matter and the primacy of the electrostatic force** in matter interactions. It also rests upon the simple assumption that the proton, neutron and electron are composed of smaller charged particles, orbiting each other in a classical sense in stable, resonant orbits. That is, the energy exchanged between those sub-particles in elastic deformation during each orbit sums to zero. Being charged, the sub-particles interact via the electrostatic force. A simple calculation shows that the sub-particles that form an electron must travel at a speed far in excess of the speed of light – some 2.5 million light-years per second, or from here to the far side of the Andromeda galaxy in one second! So the electrostatic force must act at a speed which is almost infinite on our scale for the electron to be stable. It is the stable orbital resonances of these sub-particles, both within and between particles that give rise to the phenomena of protons, neutrons, electrons and atoms. Other denizens of the particle “zoo” are merely transient resonant states of the same charged sub-particles. The so-called “creation” of matter from energetic photons is an illusion in which pre-existing matter is reorganized into new resonant states that give the impression that a particle has suddenly materialized. Antimatter is a misnomer since it too is formed from the same sub-particles as “normal” matter except that the total charge is mirrored. Matter cannot be created or annihilated. 2a. Electric forces. A positive charge and negative charge attract each other, but similar charges repel. Electric forces keep the atoms together (“bind” the electrons to the nucleus). They are of a certain importance in the nucleus. At large distances electric forces are usually not so important because of a screening effect. For example, a positive charge attracts negative charges to its neighborhood so that they screen off the field from the positive charge. 3. Gravitation is much weaker than electric forces and therefore of no importance in the atom. As the gravitation cannot be screened, it is the dominating force at large distances. The orbits of the planets and the motions of stars and galaxies are ruled by gravitation. For the first time the highly successful quantum theory gains a physical explanation in terms of resonant motion of charged particles, mediated by a near-instantaneous electrostatic force. A quantum electron orbit is one in which the exchange of energy between all of the sub-particles in the nucleus of an atom and those in an orbiting electron, sum to zero over the orbit. Exchange of energy takes the form of distortion of a particle to form an electrostatic dipole or a move to a new resonant orbit. Relativity Theory Einstein’s Special Theory was designed to define simultaneity in a universe where the fastest force or signal was restricted to the measured speed of detection of light from a distant source. With an electrostatic force of near-infinite speed acting between the sub-particles of all matter, relativity theory reduces to classical physics. This leaves open the question of what we are measuring when we determine the speed of light. The speed of light in galactic terms is exceedingly slow, requiring about 150,000 years to cross our galaxy. However, the astronomer Halton Arp has shown that the redshifts of entire galaxies are quantized which requires some form of near instantaneous, galaxy-wide communication at the sub-atomic level. There are now several reported experiments that demonstrate faster than light effects. With the Special Theory gone, and the universe in communication with its parts effectively in real-time, there can be no time travel as space and time are independent. Common sense has always suggested that this was so. Einstein’s General Theory was devised to explain gravity. It attempts to discard the observed action-at-a-distance of gravity by proposing a counter-intuitive warping of space in the presence of massive objects. This unnecessary complication of space is then added to the current metaphysical concepts of what constitutes the mass of an object. But space must also “warp” at near infinite speed to produce the observed planetary orbits. Common sense, observation, and parsimony of hypotheses all suggest that the electrostatic model of gravity (see below) is superior. There is now experimental evidence from gravity measurements at the time of a total solar eclipse that supports the Electric Universe model and discounts the General Relativity model. 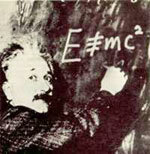 Einstein’s famous mathematical expression E=mc2, equating energy and mass is known by almost everyone. However, most textbooks go on to use the word ‘matter‘ in place of ‘mass.’ But nowhere has it been shown that mass and matter are interchangeable. In fact, we are entirely ignorant of what constitutes the mass of an object. So it is inadmissible to imply that energy and matter are interchangeable. The ultimate expression of this idea led to the nonsense of the big bang. It seems simpler and more sensible to suggest that both nuclear and chemical energy is released or absorbed by the rearrangement of the resonant orbits of charged particles. It is then common sense to suggest that mass is the measured response of a system of charged particles to an external electrostatic force. The more massive an object, the more the electrostatic force contributes to the elastic deformation of its protons, neutrons and electrons, rather than their acceleration. This is the phenomenon seen in particle accelerators and conventionally attributed to relativistic effects. But relativity reduces to classical physics in a universe where the electrostatic force has near-infinite speed. The first question to be asked is – if it is that simple, why hasn’t it been thought of long ago? The answer seems to lie in the propensity for mathematical theory to supersede common sense and observation. There is also a problem of language when mathematicians attempt to provide real meaning for their symbols. The consequences and possibilities in an Electric Universe are far-reaching. First we must acknowledge our profound ignorance! We know nothing of the origin of the universe. We have no idea of the age or extent of the universe. We don’t know the ultimate source of the electrical energy or matter that forms the universe. Quasars evolve into companion galaxies. Stars are electrical ‘transformers’ not thermonuclear devices. We don’t know the age of stars because the thermonuclear evolution theory does not apply to them. Supernovae are totally inadequate as a source of heavy elements. We do not know the age of the Earth because radioactive clocks can be upset by powerful electric discharges. The powerful electric discharges that form a stellar photosphere create the heavy elements that appear in their spectra. Stars “give birth” electrically to companion stars and gas giant planets. Life is most likely to form inside the radiant plasma envelope of a brown dwarf star! Our Sun has gained new planets, including the Earth. That accounts for the ‘fruit-salad’ of their characteristics. It is not the most hospitable place for life since small changes in the distant Sun could freeze or sterilize the Earth. Planetary surfaces and atmospheres are deposited during their birth from a larger body and during electrical encounters with other planets. Planetary surfaces bear the electrical scars of such cosmic events. The speed of light is not a barrier. Real-time communication over galactic distances may be possible. Therefore time is universal and time travel is impossible. Space has no extra dimensions in which to warp or where parallel universes may exist. There is no “zero-point” vacuum energy. The invisible energy source in space is electrical. Clean nuclear power is available from resonant catalytic nuclear systems. Higher energy is available from resonant catalytic chemical systems than in the usual chemical reactions. Biological enzymes are capable of utilizing resonant nuclear catalysis to transmute elements. Biological systems show evidence of communicating via resonant chemical systems, which may lend a physical explanation to the work of Rupert Sheldrake. DNA does not hold the key to life but is more like a blueprint for a set of components and tools in a factory. We may never be able to read the human genome and tell whether it represents a creature with two legs or six because the information that controls the assembly line is external to the DNA.